After a day on the road yesterday traveling home, it’s easy for me to envision this winter break ending soon. What an amazing time with friends and family! And I only took pictures at the beginning and the end so my reporting is going to be random! 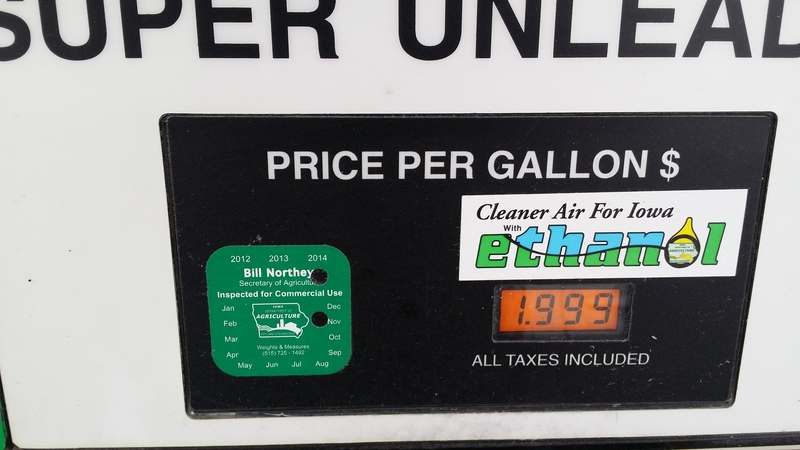 Traveling by car: the price of gas was amazing! Friday, December 19th at the New London, Iowa Casey’s the price of a gallon of gas was $1.99. This was en route to the Moline airport to pick up the kids when they flew in. 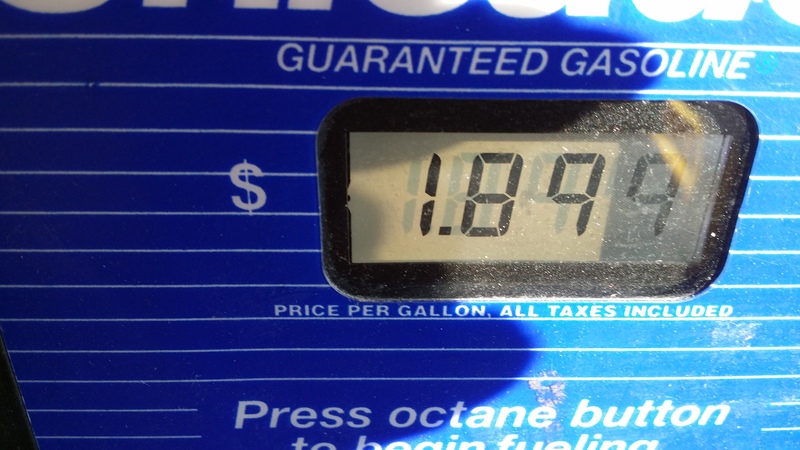 On Monday, December 29th at Columbia, MO, the price of a gallon of gas was $1.89. This was on the return to Iowa signaling the last turn north to home. Of course there were other tank fill ups during our travels but any and all that were under $2.00 per gallon were particularly noted. On our path to new memories and traditions, we held a surprise baby shower for my daughter-in-law who believed that the surprise was that she and my son were in Iowa for the family Christmas. (The family did not know that she was accompanied by her husband so there was a surprise for everyone!) 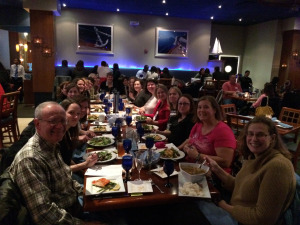 Even better, the projected overseas deployment is canceled for now so there was much to celebrate! Guests brought favorite books to share so the book shelf in the baby’s room will be filling up and the “onesie-decorating” contest was fun for all. Proud of the many artists in the family. And special thanks to my sisters for organizing and planning the shower! The Ruth family Christmas (my mom’s brothers and sisters and offspring) was well attended. We had the “family that came the farthest” – sister from Florida with her boys as well as five out of six children present for a high family attendance. My son noted that he could tell he was in Iowa as there were five different corn dishes! And then in Kentucky, we had great meals with many contributions from family members attending! Debbie’s turkey was marvelous (so was her potato soup- different meal!)! John’s hash brown casserole – amazing! Aunt Lisa’s pies! Julie’s peanut butter balls and cake-batter bark were automatic hits! So many choices . . . all great cooks! We had a total of six different Christmas congregations between Iowa and Kentucky. These involved parents, grandparents, aunts, uncles, cousins, nieces, nephews, and many more! Thanks to all family members for the great conversations, gifts and celebrations together! Making the special effort to spend time together for the holidays and for family . . . Heaven! What new memories/traditions did you begin/celebrate? Two great posts recently include this from Kate and Maggie and this from Anna Gratz Cockerille. As a “Slicer”. . . I want to express my gratitude to the Two Writing Teacher blog and bloggers. 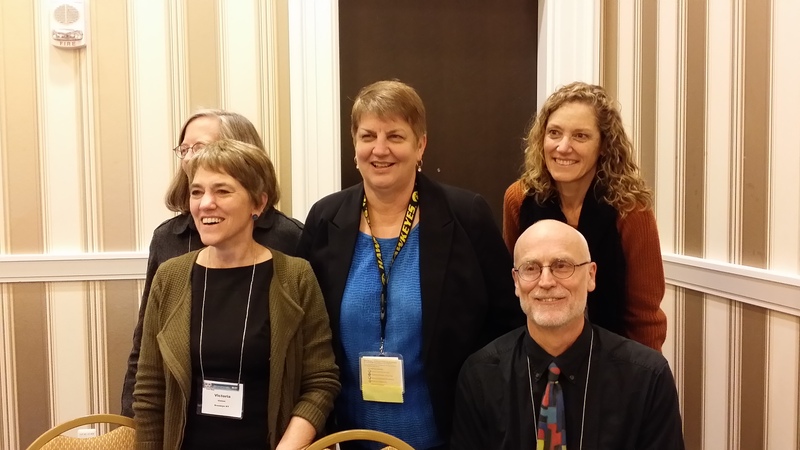 After meeting and hearing from five of them at #NCTE14, I am even more impressed with their prolific blogging, slicing, and “regular working lives”. 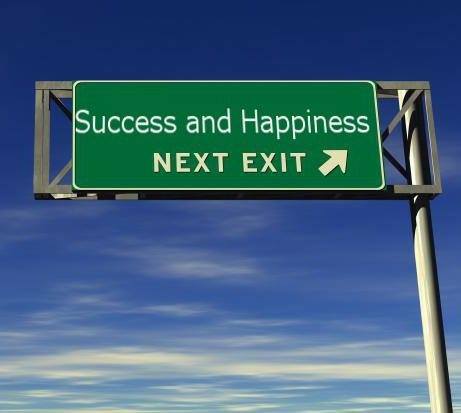 As with everyone, there is the need to be cautious and not burn oneself out in an attempt to do EVERYTHING! I am very grateful for this supportive space to read, write and reflect! As a “Blogger” . . . I want to express my gratitude to all those who follow my blog, read my posts, and especially for those who comment. I really appreciate knowing which ideas or words captured your thinking as you read my blog posts. We are all busy so I am very grateful for the extra time that you take to not only read but also to stop and comment! As a “Tweeter” . . . 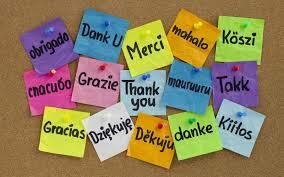 I want to express my gratitude to my followers who RT and / or “favorite” my Tweets. 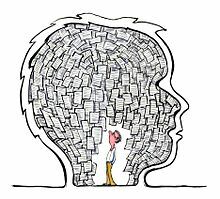 Special thanks to those who don’t moan on nights when the Twitter feed fills up during a # #T4Tchat or #TWTchat or a #TCRWP chat. I love learning online and I am so grateful for the brilliant ideas shared! As a “Reader of Professional Texts” . . .
As a “Fra-mily” . . . I want to express my gratitude to those of you who may also be in all the categories above but who have become a part of my friends + family as a result of our personal face-to-face connections (often over a beverage or dinner), Twitter chats, blogs and Slices. You range from Arizona, California, Washington, Iowa, Illinois, Ohio, Pennsylvania, New York, New Jersey, Connecticut, Maryland to Virginia, Georgia, and Louisiana. It is an honor and a pleasure to “KNOW” you and I am grateful for the time spent with you sharing online, face-to-face, personally and professionally. As a member of our “Literacy Team” . . . I want to express my gratitude for those of you who are part of my regular work team. Together we are better! Sharing resources, information and learning helps us all grow. A growth mindset allows us to be continually improving our own skills. I am grateful for our collaborative nature. As a “Sister” . . . I want to express my gratitude to my siblings. It’s been years since we have been under one roof for extended periods of time, but each family event provides many opportunities to share our hopes and dreams. Sometimes we even reminisce about the past and we are at that stage where our memories may have faded but our enthusiasm remains. I am grateful for our time together. As a “Daughter” . . . I want to express my gratitude to my parents. Miss you, Dad, but think of you daily with so much love as I continue to appreciate all that I learned from you. Mom, I’ll never master crocheting and quilting, but I love your work and still share hearts as I travel. I especially appreciate your love and support across the years and the miles. As a “Mom” and soon-t0-be Grandma . . . I want to express my gratitude to you my readers who have graciously allowed me to share my stories. I am proud of my growing family and can’t wait to share their brilliance with you! I wish you all a happy, healthy, joyous, and fun-filled holiday season! What’s your plan for sharing your gratitude? Individual words are added together to create sentences and then accumulated into documents, speeches, and presentations of all types. Is one format valued or privileged over another? A word in “Words with Friends” has a point value and is part of a competition. Will my total point value exceed yours? If yes, that game will be added into my total as a “win”. But what about the words that I have evaluated and added to my own vocabulary as a result of “playing Words with Friends” and stretching my own vocabulary use? How is the value of words shared? Do both the author and the reader have equal responsibility? How and and when is that “power” or “value” passed from one to the other? What is the lens that we use to consider our words? 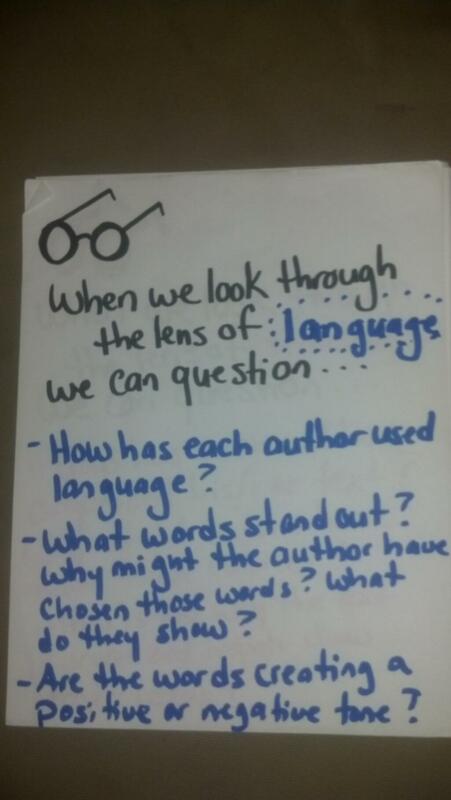 I remember Kelly Boland Hohne at #TCRWP using the “lens of language” to see more as readers. These questions help a reader focus on how an author has used language. Is their value in talking about the power of words to help, to heal, to share, to live and even perhaps to love our friends, family, and neighbors? What about that positive or negative tone? Did the message transmit as intended? Did it perhaps go a wee bit astray? Which words are you regularly using? What message does your “word use” send to others? How do you value words? How do you share that value with others? If you are interested in a bit of nostalgia (AKA classic rock), you can listen and watch the following video. But I didn’t really believe that I would not ” get into my session” once I made my final choice. It was my first trip to NCTE, but I have attended IRA multiple years and even the World Literacy Congress in Edinburgh, Scotland in 2002. Imagine my shock when I didn’t get into my first session choice or my last session choice. I assumed that due to the notoriety of the speakers, the presentation would be in a ballroom at least. Not so! Small room! Full room! Some chairs were eventually brought in and a few others were allowed in to sit on the floor. The door guard was adamant about observing the “fire code” rules. I knew I was missing out. I sat on the floor and logged into wi-fi and hopped onto TweetDeck on my pc. It was soooooooo slow. I often live by data. (Sorry! I know that is shocking!) But 140 character tweets were “averaging” three minutes to send. Connectivity was not a strength of the convention center. Without a calculator that meant approximately 50 characters sent per minute! . . . . SSSSSSSLLLLLLLLLLOOOOOOOOOOOOWWWWWWWWWWWWW! Plan C: I closed my iPad and pulled out my personal Mac Air Book that was my reliable all day lightweight tech friend for two weeks of Writing and Reading Institutes at #TCRWP last summer. Another series of log ins in order to connect to the wireless for NCTE. Password in. Tweetdeck up on Google Chrome. No tweeting . . .
1) check out the room for our presentation – hmmm, table set in center, not set in rows of chairs . . . . . looking small . . . room located! 2) check out how well technology worked and preview our google presentations (3) and pdf formats (2). Google was sssssssllllllllloooooooooooowwwwwwwwwwwwww! My presentation (heavy on pics) did not load. I tried Julieanne’s. After about 15 minutes, all but four pages had loaded. Technology was not cooperating very well. However (glass half full), it’s only Thursday and I have more than 24 hours to come up with a plan! The plan for converting from google presentation to an offline format worked (combo of pcs and Macs) so we went with PDFs in a common google folder (not everyone had Office so powerpoint download was not going to work). Reality: Not getting into my first Thursday session meant that I had the information that I needed in order to scope out our presentation room, check out weak tech and devise a work around and check into our hotel room before the next session. The sun, earth and moon continued to revolve and rotate as they always do. . . Life was good! What I wanted: To attend the Kelly Gallagher and Penny Kittle session on Voices in Democracies on Sunday. So instead, I went to a poetry session. It was fabulous. Multiple poets and teachers shared student writing that made us laugh and cry. Mary Lee, Catherine, Cornelius, Katie. . . were all there. Words, images, and voices filled my soul! I still had books to pack to ship home. I decided this gift of poetry from the heart would be my last session. 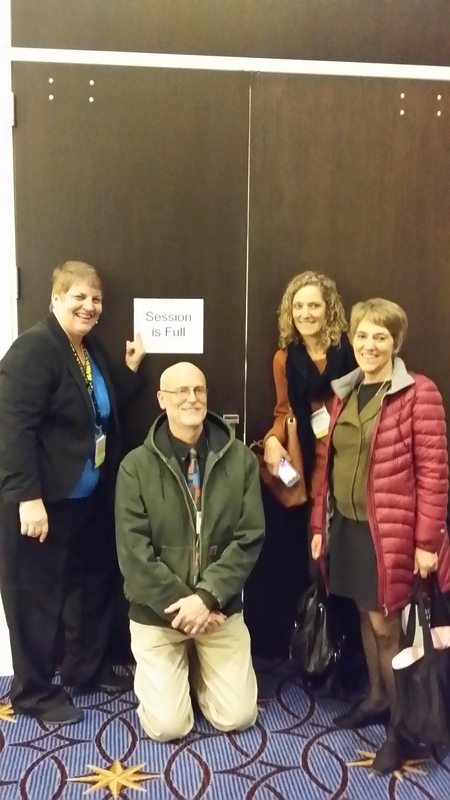 Reality: Poetry, and the power of words, was one theme of #NCTE14. It fit in with the “Be Kind” theme from Lester, Colleen, and James Howe where “laughter meant learning was taking place”! I had time to hang out and chat a bit with my roomie as she packed up to leave. Another gift of time. Time to chat about our learning and our plans to use that learning. When have you gotten what you needed instead of what you wanted? 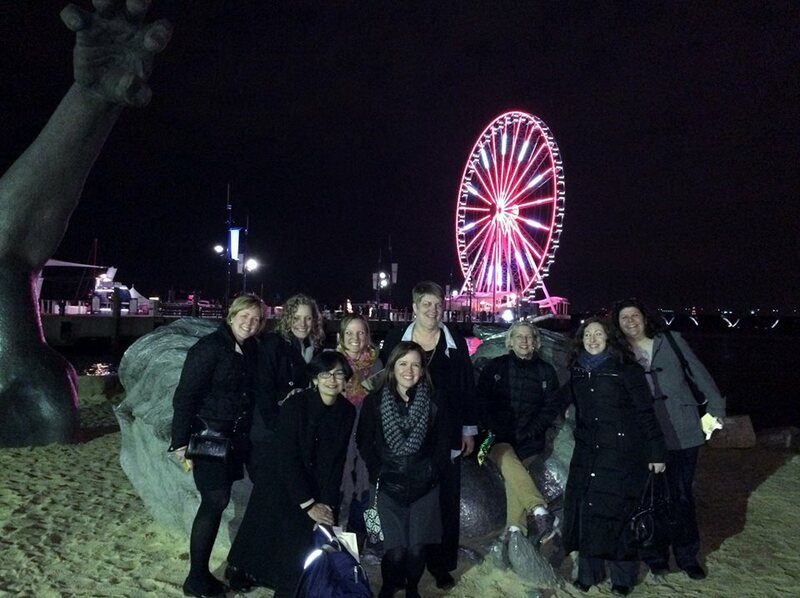 Posted in: Slice of Life 14	| Tagged: NCTE14, Rolling Stones, You can't always get what you want! 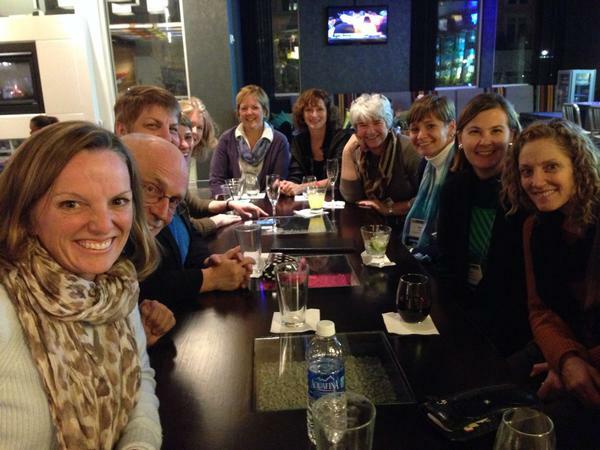 Are you one of the 18 “slicers” who will be dining together this Saturday night at #NCTE14? If not, check out the slicing posts and become a regular slicer so you will be ready next year! So in writing (narratives, informational, arguments), what transfers (#OLW14)? Is it the hook, the organization, the voice, or the purpose? I can identify writer’s techniques and goals in order to READ like an author for deeper understanding! I can use those techniques and goals to dig deeper into the elements of the written genres under review. I can use author “language” to increase my knowledge of writing techniques and choose quality texts to share with students. In order to stimulate thinking, create conversations, and pay attention to commonalities and similarities, I chose to introduce writing techniques and goals for informational, argument, and narrative all in the same session. 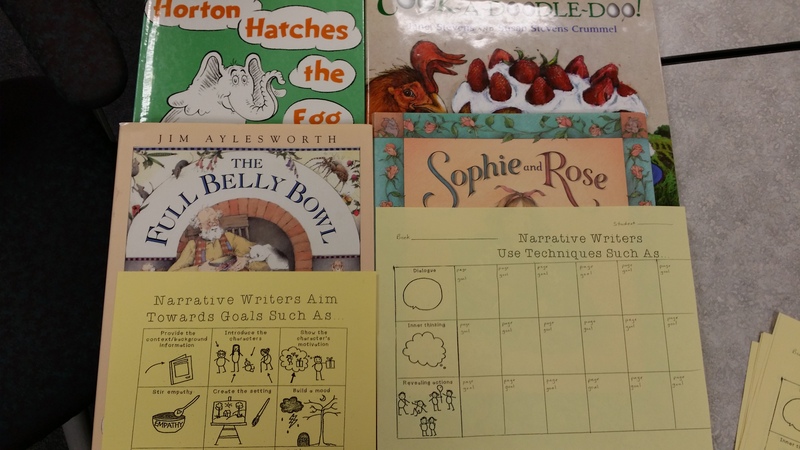 Back in July, 2014, I wrote this post about how we used “goals” to look for examples in mentor texts. Take a minute to reread that post here. What do we actually do in PD? We use combinations of National Geographic’s Wolves and Seymour Simon’s Wolves to play bingo with the entire card (3 x 4 array) using the techniques side. The small rectangular post it covers the technique and allows one to add the page number for the location of the technique in the text. The deliberate use of two texts on the exact same topic where each one has a different style and purpose creates fun conversation for teachers. Then we wrap up with a “Know/Wonder”(source: What Readers Really Do by Dorothy Barnhouse and Vicki Vinton) chart to summarize our findings and consider which book would best meet which goals as well as a myriad of reasons why/where/when we would choose which text. (More subtle, less reliance on text features? Find another book where an author has written like Seymour Simon’s Wolves!) 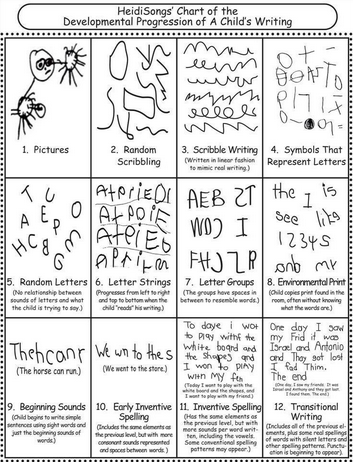 Result = fabulous conversations around common literary techniques and goals using the same “naming words” across all grade levels. Process: Everyone looked at both books with a bit more structure (12 cards each) and less independence for this first round. Goal = identify the techniques and name those that “surprised” the reader. 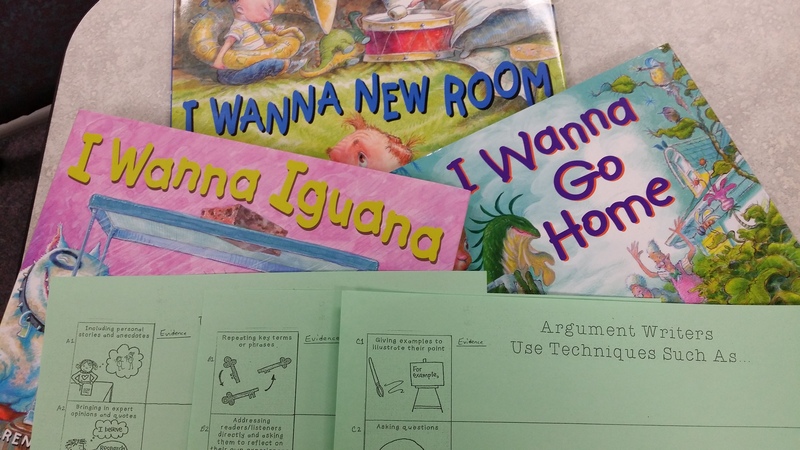 In this activity, teachers look at one column of the “techniques for writing arguments” page for texts that had recently been read in class, either by the teacher or by fellow students. Again, we use a “Know/Wonder” chart to summarize our learnings from this section. Process: Each partner group had one of the “I Wanna . . .” series by Karen Kaufman Orloff and illustrated by David Catrow with either the vertical Column A, B, or C from the Argument Techniques cards to look for specific techniques with room to “jot” evidence for “Know/Wonder” chart. 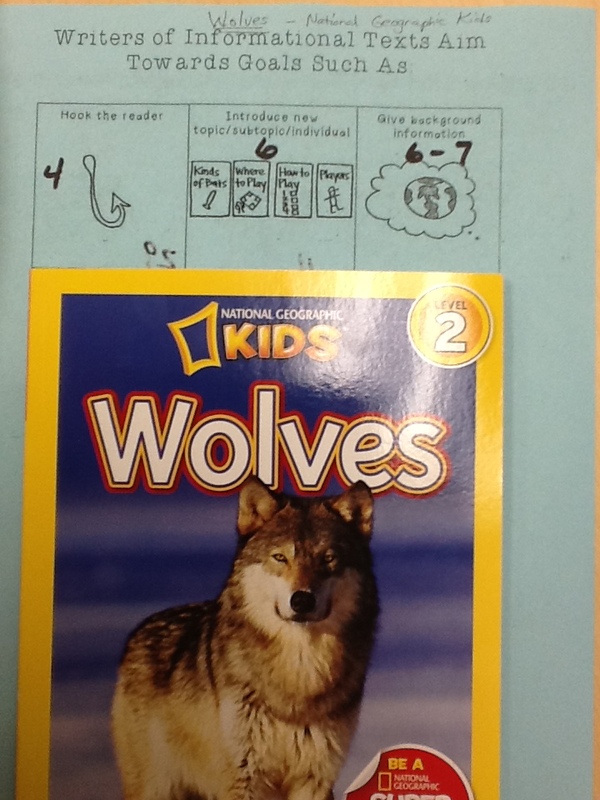 Each partner group has only 4 technique cards to look at books in a “series” by the same author. Goal = discuss patterns the author uses across her series and consider how this information can inform readers AND writers. In this activity, teachers look at just three of the “techniques for writing narratives” and the narrative “goals page” in order to consider how the authors used dialogue, actions and inner thoughts to achieve their narrative writing goals. Each participant jots down page numbers and goals on a response sheet and then discusses what they notice in their books. Whole group debrief is through the continuation of the “Know/Wonder” chart. Process: Each partner group had a different narrative. Each group chose one technique they wanted to explore and then following a “write-around”, the book and notes were passed on to the next partner group. Each group had time to analyze two books. 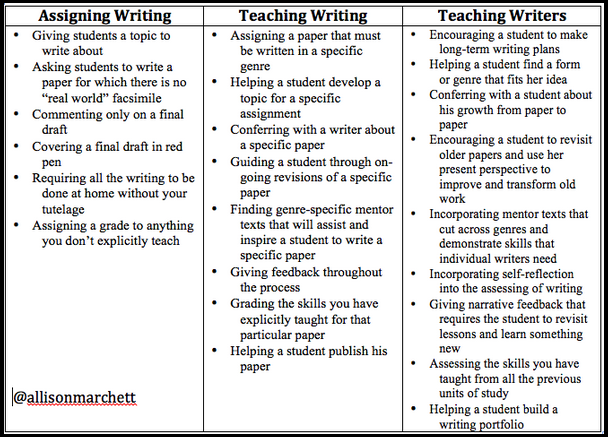 Goal = Readers and writers will recognize that techniques look very different when considering differences in authors’ styles, audience, and purposes for writing. As a reader, when do I name those techniques in order to increase my understanding? As a writer, when do I “try out” those techniques in my own writing? 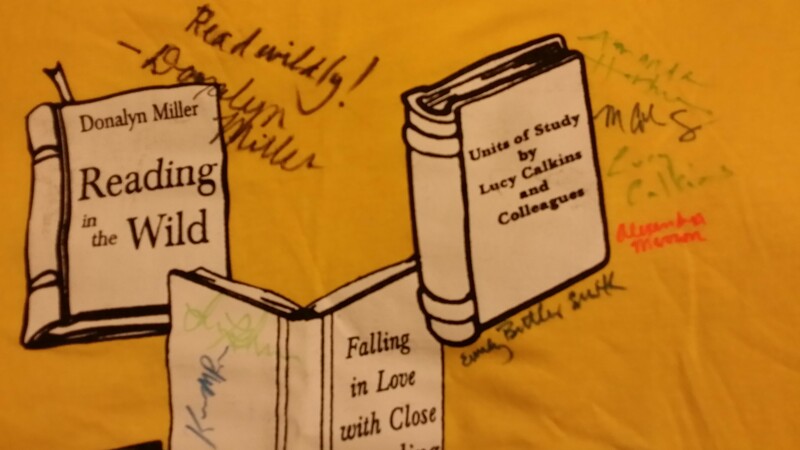 As a teacher, how does knowledge inform my deliberate choices for Read Aloud texts? What writing techniques and goals do you point out in Read Alouds? 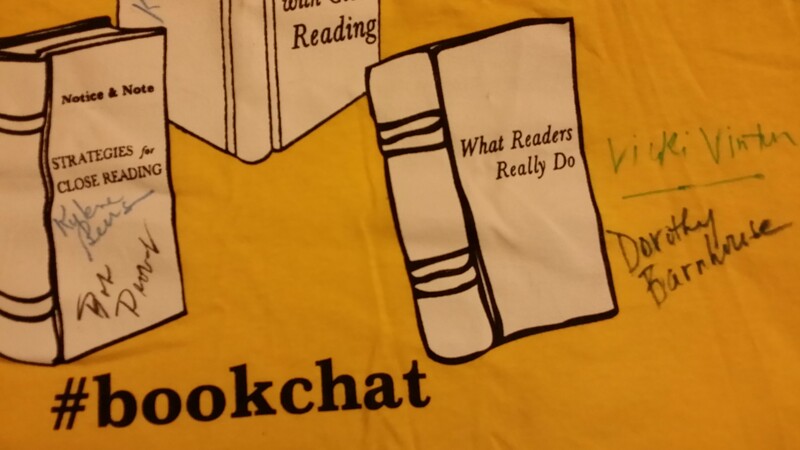 How do you use your knowledge of “author’s craft” to help you select your Read Alouds? As professionals, how do we show that we are learning and growing? Is it in our annual professional growth plan? Is it a part of our daily work? For those of us who are PD providers, how do we maintain that trust with teachers that is evidence that we are continually learning and growing? How do I continually push myself? After a two day UbD training opportunity, my partner and I received the following comment from a teacher: ““This was very beneficial. It was one of the best PD experiences that I have participated in. I can walk away saying that I learned a lot. This is the first time that I have actually been able to put the Iowa Core Standards into action!” What a compliment for both of us! One reason that we both “pushed” for the UbD work was to literally help our teachers gain a deeper understanding of the Iowa Core as they aligned the desired results with the assessments and the learning plan! Where did the question about learning, growing, and pushing ourselves come from? A tweet last week . . . The author of that tweet was @venspired shown below! How do you continually push yourself? What does your evidence look like? Our focus for curriculum development for all content areas is Wiggins and McTighe’s Understanding by Design (UbD). UbD is one of three models typically used in Iowa. Since June, we have worked with four different groups of ELA teachers and administrators to begin development of “units” through the UbD planning process. We have also worked with two content area groups on how to use the ELA Standards for all content areas as required by the Iowa Core Standards. Jay McTighe will be in Iowa next week for the fall ASCD conference to work with educators on unit design to improve understanding. What a great opportunity to increase our own understanding of UbD. In the UbD model, what is transfer? As a teacher have you ever taught something, given students time to practice, used a formative assessment, but still had students fail the summative task? I think that the typical ubiquitous spelling list often led this category for many students. Transfer can only happen when there is reflection, analysis, and generalization from the lessons learned as “rote memory tasks” do not typically “transfer” learning. So are hands-on projects conducive to “transfer” of learning for students? What does transfer look like? So how does transfer fit into my life as a Reading Specialist? What are my expectations? Considering Transfer and Professional Development. . . .
Teachers will practice and use modeled lesson in PD..
Teachers will use lesson in classrooms. Teachers will independently use lesson in other content areas/situations in their lives! Considering Transfer and Students . . . .
Students will practice and use the lesson in class. Students will use the lesson in other classrooms where not taught. Students will apply the learning on their own, in any situation, without help! Possibilities for transfer . . . There are many paths for instruction, further work with UbD and even this post by Anna Gratz Cockerille, “Using assessment tools to teach transference”. with my “One Little Word” I am looking for transfer every day. What is your understanding of “transfer”? Do you see teachers or students “transferring” their learning?